Phew, that looks great! E-Capcom has lifted the veil off the Rockan's final packaging; a colorful display of everything included in this huge Japan-exclusive set. Did I mention it's huge? Due out on September 19th, the Rockcan is loaded with music from Rockman 1 ~ Rockman 10 (complete track list here). The PlayStation Complete Works remixes and three original Saturn version songs from Rockman 8 are also included. Further, we are now able to confirm the addition of a few other neat bonuses. 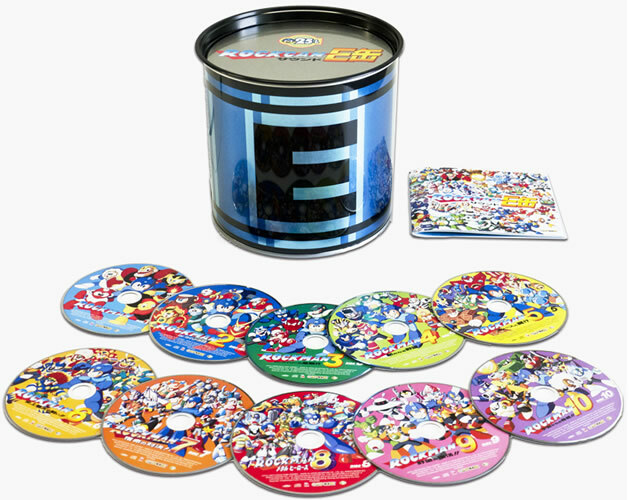 According to the latest details, Capcom's sweetening the pot with both Rockman Special CDs (music by Alpha Lyla) and an unused Rockman 7 track (this?). Neato! The whole kit and kaboodle will set you back a whopping 14,700 Yen. If you're looking to import, CDJapan's got your back (for a price). Ebay is also a good idea. I think i'll wait until they release a "anything but classic" MegaMan OST, Preferably Network time line based. Then i'll find they won't make one haha.. It would be cool to own this, but importing anything from Japan these days costs an arm and a leg ($200+ for a few CD's? Dream on!). Good to know the U.S. economy isn't the only one in the crapper, I guess. If this was every song in the whole franchise, it'd be worth that price. But just for ten games? Pass. Still not impressed with Capcom's offerings thus far. Wow, that actually looks amazing! Are these soundtracks all-encompassing? Does anyone know the tracklist? @Pluvius: It's everything from 1-10. Everything. There's a track list at the e-capcom link. Scroll to the bottom of the page. It's broken down by game. This is all pretty great, but like everyone else said, it's too expensive!! I suppose the set isn't too bad after all. The price is still a bit steep for me though. Still more expensive than it is worth. Music CDs and DVDs are expensive in Japan. I bought a game soundtrack back in the late 90s at a local store that did imports. They had branches in the US and Japan, so their prices weren't marked up. Just straight yen to dollars based on the exchange rate. The soundtrack had ONE disc, and it cost over $40. So I don't think the price is too out of line. Well, I know what I'M torrenting in a couple of months, that's for sure. Oh wait, all of this is already available elsewhere, and I already have it on my external HDD.